Master storyteller James C. Christensen’s The Bride is a beautifully detailed homage to the traditions and folklore of the wedding day. 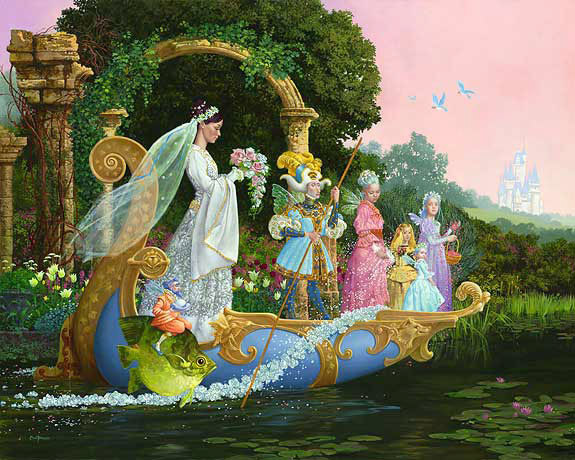 The stage for this joyous vision in a pastel palate is set in a Christensen fantasy world, as we join a maiden and her unusual wedding party sailing into destiny. Richly layered nuptial symbolism awaits your discovery: something old (the ruins in the background), something new (the egg on the pillow), something borrowed (a tan girl from Baroque artist Diego Velázquez), something blue (the flowing ribbon in the bride’s hair, a symbol of purity from ancient Israel). That’s only the beginning! Much like the art of marriage itself, Christensen’s The Bride promises years of unfolding pleasures. The Bride copyright © 2005 by James C. Christensen is prohibited from being copied.